Inigo Jones' design at No. 59-60 copied by No. 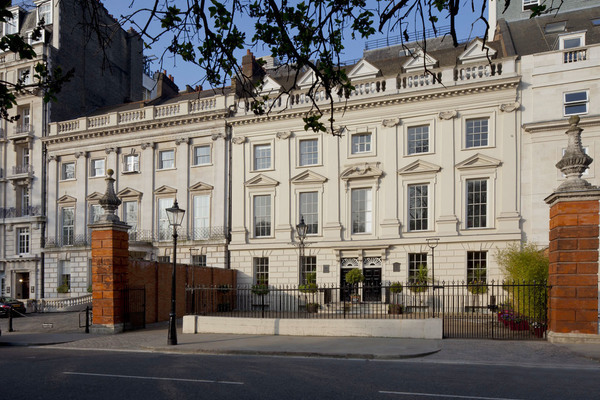 57-58, with portico and elliptical staircase added by Soane. 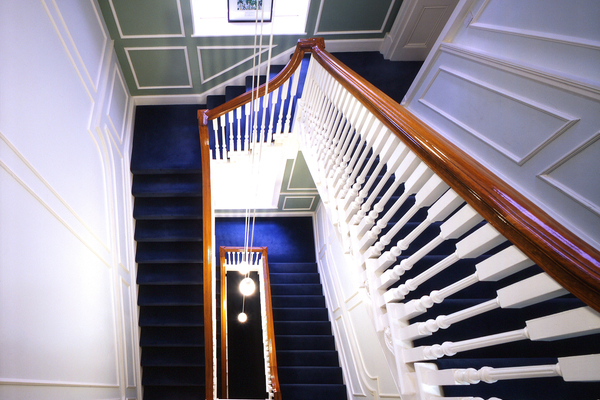 Refurbished by current occupiers, a barristers' chambers. Retains original features, staircases, fireplaces, and mouldings. Welcome to Garden Court Chambers. These are two buildings remarkable for their architecture, historical and literary associations. The current occupiers, a barristers’ chambers, which moved here from the Middle Temple in August 2005, are delighted at this opportunity to share these buildings with you. Because of the confidential nature of our business this will be by guided tour. The two buildings are 59-60 and 57-58 Lincoln’s Inn Fields. 59-60 was built by 1640 as part of London’s first garden square and is the only remaining example of its type from that time (although much copied) (1). The design has been ascribed to Inigo Jones. It has been written that it shows what he intended the whole square to be like (2). However these sources are over 100 years from construction. The safest view is that it is in his style (3). More recently the designer (and possibly builder) has been identified as Nicholas Stone, Master Mason, who worked with Jones on the construction of the Banqueting House in Whitehall (8).The land on the west side of the Fields had been used as rough pasture before, apparently for the coach horses of nearby inns. The barristers of Lincoln’s Inn had opposed development, but in the 1630s (the period of the 1st Stuart Tyranny) Charles I, eager to raise money and responsive to a genuine shortage of housing, sanctioned building here and elsewhere in London (4). The exterior is virtually unchanged from completion-including the columns with the stone vases on top at the gates. A crowned female bust which once stood above the central window on the 1st floor had gone by the early 18th century. Built of brick, the front was stuccoed and painted over. Internally, the oak floor in what is now the main reception is believed to date from 1640. The well staircase is also of oak. The ornamental alcove with the coat of arms in reception dates from 1759 (Isaac Ware). The fireplace in the same room comes from Spencer Perceval’s occupation (1791-1812). Sir John Soane carried out the limited works required to reunite 59-60 for Perceval in 1802 after Isaac Ware had divided them (5). Since then it has remained one building. The present 57-58 was built about 1730, replacing a previous structure. Although it was intended to be the same design as 59-60, it attracted early criticism (1734) for failing to be of the same quality and detracting attention from 59-60 because of its height (3). With one exception the exterior, which is of stone, has changed even less than that of 59-60. Originally it was one house with one door. In about 1795 Soane divided the house into two (the reverse of what he was later to do at 59-60), created two doors, and masked them with the current Roman Doric porch (5). 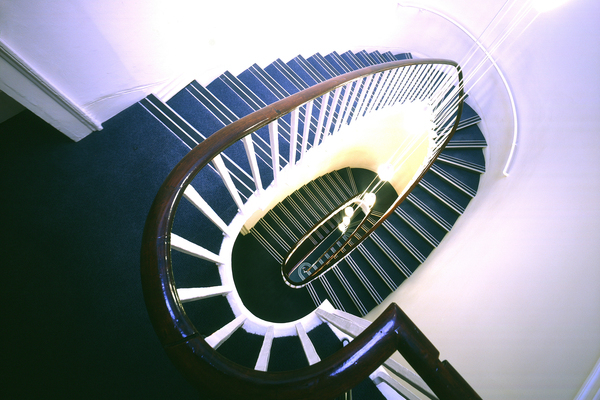 The elliptical staircase running from the basement to the top of No 57 was inserted at this time and is one of the most attractive features of the building. It is one of only three known existing elliptical staircases of Soane’s – apart from those in Sir John Soane’s Museum also in Lincoln Inn Fields. The exteriors are Grade 1 listed. Some sources say 59-60 was lived in by Robert Bertie, 1st Earl of Lindsey (Charles I's general at the battle of Edgehill in 1642 – the first major battle of the English Civil War) at which he was killed. However, this association is probably a confusion with two Earl Lindseys who lived here after 1685 – and from whom its common description in the books of “Lindsey House” is derived. In 1683, during the 2nd Stuart Tyranny (1683-5), a friend of the family of the then occupier Lord Winchester, Lord William Russell was beheaded in Lincoln’s Inn Fields after having been convicted for treason by association with the Rye House plot – the aim of which had been to assassinate Charles II and James, Duke of York – the future James II – in order to prevent a Catholic accession to the throne. In a gruesome aftermath his body was brought into the house and his head sewn back on before being carried off for burial (3) (6) (10). Some of the more imaginative members of the Chambers criminal team have declared the blood stain can be discerned on the main reception floor. Spencer Perceval has the distinction of being the only British Prime Minister to have been assassinated – on 11th May 1812 in the lobby of the House of Commons – by a bankrupt who had a grievance against the government. The deep safe in which it is believed he kept his ministerial red boxes is in reception. 57-58 has a gentler history. Edward Montagu, the Earl of Sandwich – a principal figure in organising Charles II’s Restoration (and whose great grandson, also Earl of Sandwich-was the creator of the comestible) – was here between 1664 and 1666. He was the patron of Samuel Pepys, the diarist and clerk to the Exchequer under both Cromwell and Charles II. Pepys visits that “fine house” on a number of occasions but notes the rent was “deadly dear” – £250 a year (3). Perhaps the only radical former occupier of these buildings was John Thelwall – a late 18th century/early 19th century agitator, campaigner for Parliamentary reform, abolitionist and supporter of women’s rights. Also a prolific poet and literary polymath, Thelwall published a newspaper The Champion, while on the premises. His day job was elocution and speech therapy and from 1813 to 1821 he lived at No 57, with his family, while treating patients and taking students at his pioneering Institute of elocution here. Thelwall described the Institute as “for the Cure of impediments of Speech, Instruction of Foreigners, Cultivation of Oratory, English Composition and Polite Literature and the Preparation of Youth for the More Liberal Departments of Active Life” (9). Tulkinghorn, the lawyer to the aristocracy from Charles Dickens’ “Bleak House” lived here. Dickens described it as “a large house, formerly a house of state. It is let off in a set of chambers, and in those shrunken fragments of its greatness lawyers lie like maggots in nuts” (2) (7). Here Tulkinghorn was found one morning shot through the heart when on the point of revealing Lady Dedlock’s terrible secret to her devoted husband (7). There is a non-fictitious association with Dickens. On 2nd December 1844 he read one of his ghost stories “The Chimes” to a company of friends including the historian Thomas Carlyle at no 58 in this building, where his close friend and subsequently his executor John Forster was living from 1834-1854 (the first occasion, it appears, on which he read one of his works to an audience). By the beginning of the 20th century the buildings had become the offices of Marks & Clerk, the Chartered Patent Agents, who acquired 57-58 in 1908 and 59-60 in 1918. They remained here until the transfer to Garden Court Chambers in December 2004. Finally your guides include practising barristers from the Chambers. If you have any general questions about the legal profession or practice in the UK, we will attempt to answer them for you. We hope you will enjoy your visit. NB Legal Papers are confidential. Although it is not intended to take you to any of the barristers’ rooms, should you see any legal papers, please ignore them. (10) See attached copy of the painting “The Trial of William Lord Russell,1683” by Sir George Hayter c.1825, courtesy of the Hull Museums Collections website.